GN solid control construction industry mud recovery systems and waste mud treatment systems have been widely used in China, Australia, the United States, and Southeast Asia, the Middle East and more than 30 countries and regions. The efficient shielded mud separation station is a key core component of mechanized tunnelling. Bentonite slurry plays an important role in the construction of the hybrid shield machine. The slurry can stabilize the tunnel support surface and transmit cuttings during the shield construction process. GN shield mud and water separation system uses drilling fluid vibrating screen, de-sanding device, drilling fluid desilter and mud centrifuge to separate drill cuttings mud mixture produced during shield construction. Through efficient and continuous separation, the excavated material is separated from the bentonite mud, and then the mud is returned to the muddy water loop and used again. GNLW764A decanter centrifuge is specially designed and developed for the treatment of shield slurry. The drum diameter is large and the aspect ratio is high. The separation factor is as high as 3000G. As a result, greater throughput can be achieved and more clear liquids can be discharged. Meet the requirements of large-scale shield machine construction. 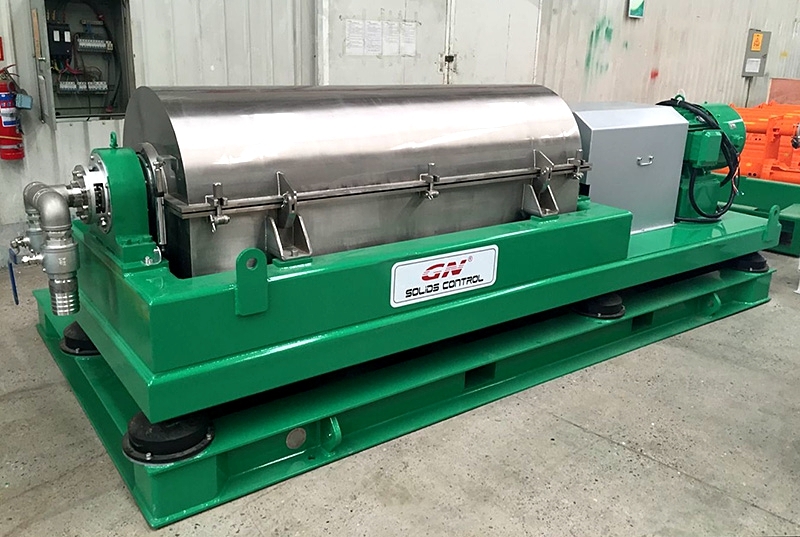 GN also provides a flocculation dosing system for chemically assisted decanter centrifuges to separate the shield slurry to obtain dischargeable clean water. The large drum meets the large throughput requirements of the shield. The aspect ratio is as high as 4.4, and the separation factor is as high as 3000G, and the separation is more thorough. 3, speed, differential speed, liquid pool depth and flexible adjustment to adjust the slag dry humidity. 4, imported CNC equipment processing, rotor after high-speed dynamic balance, automatic lubrication. 5, equipped with 25000N.M large torque differential to meet the heavy load processing. 6, Centrifugal pouring drum, wear-resistant alloy blade protection, slag discharge wear protection sleeve, SKF bearings, greatly improve the service life and reduce maintenance costs. 7, PLC intelligent control system, HMI visual operator interface, bearing temperature protection, vibration protection, overload protection, easy to use.